Well, business in front when you have a SHIRT on. The mullet goes back to the 60s. But that nascent coiff wasn’t the x-treme Kentucky Waterfall the mullet (d)evolved into. No, the Tennessee Tophat, Ape Drape, Missouri Compromise, Camaro Cut, Louisiana Purchase, Sho-long, Mississippi Mudflap, or what we in Vermont like to call the Canadian Passport reached its perfected plumage potential — fueled for take-off by Bono and MacGyver and adapted by NASCAR trendsters into the sooperhot, pants-dropping fem-mullet — in the 1980s. When fashion did things it had never done before and hopefully will never do again. Business in the front, party in the back…right on. 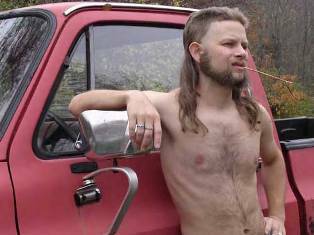 As People of Walmart have proven, the mullet is making a comeback.